Manulife is among insurers seeking to boost fee income from overseeing funds for institutional and retail clients. To be based in Toronto, Sotorp will report to Warren Thomson, chairman of Manulife Asset Management. (Bloomberg) — Manulife Financial Corp., Canada’s largest life insurer, appointed UBS AG’s Kai Sotorp as chief executive officer of the asset-management unit overseeing CDN$298 billion ($273 billion). Sotorp will be based in Toronto, subject to immigration approvals, and report to Warren Thomson, who is chairman of Manulife Asset Management and held the CEO title on an interim basis, the insurer said today in a statement. 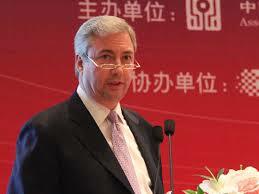 At UBS, Sotorp was CEO in the Asia Pacific region of the global asset-management business, according to the statement. He was based in Hong Kong and oversaw $120 billion and 495 employees, Manulife said. Manulife is among North American insurers seeking to boost fee income from overseeing funds for institutional and retail clients. Canada’s Sun Life Financial Inc., along with MetLife Inc. and Principal Financial Group Inc. in the U.S. have all announced plans to bolster asset management. Sotorp will also work in product development and distribution with the operations providing mutual funds, group pensions and investment-linked insurance globally, according to the statement. Manulife sells insurance and retirement products in the U.S. under the John Hancock brand. Sotorp has an MBA from Harvard Business School and a bachelor of science degree from Boston University, according to the statement. He previously worked for American International Group Inc. in Japan. Manulife said his appointment is effective on or about July 1.